Cool! You didn't sound critical! I am fine with people saying that i won't work and i actually enjoy it as long as they help with a solution. Know someone just saying that its gonna fail and then leaving is what i don't like. Just be aware of the amps the four motors will be drawing when delivering over 4 lbs total thrust. It could well be 13A per motor so a total of 52A. Hopefully full power will only be required for very short bursts but If not it would drain a 2200 mAh battery in no more than 3 minutes. Ok, Thank you Qourneng! I know very little about amps/volts/ESC/Motors/battery so i really appreciate your help! Hey guys, just figured that i would update you on where i am. 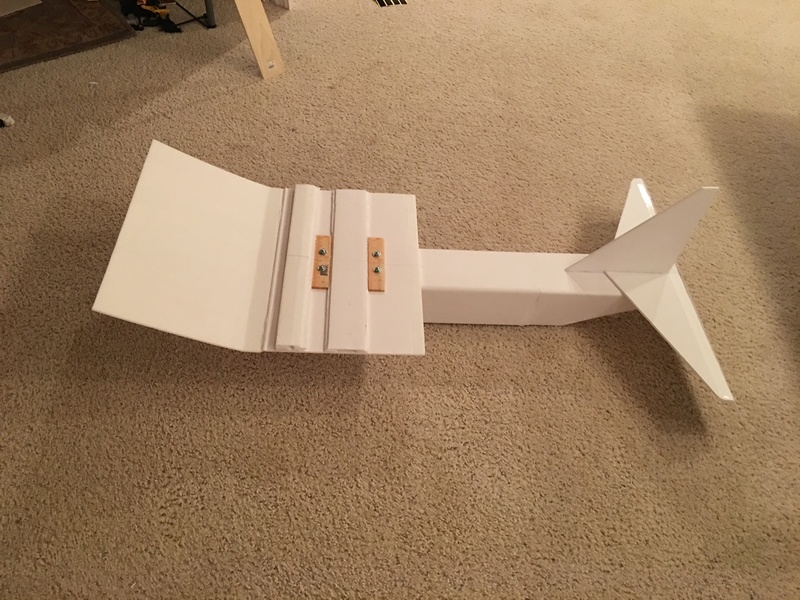 I am just about to build/attach the bigger vertical and horizontal stabilizer. 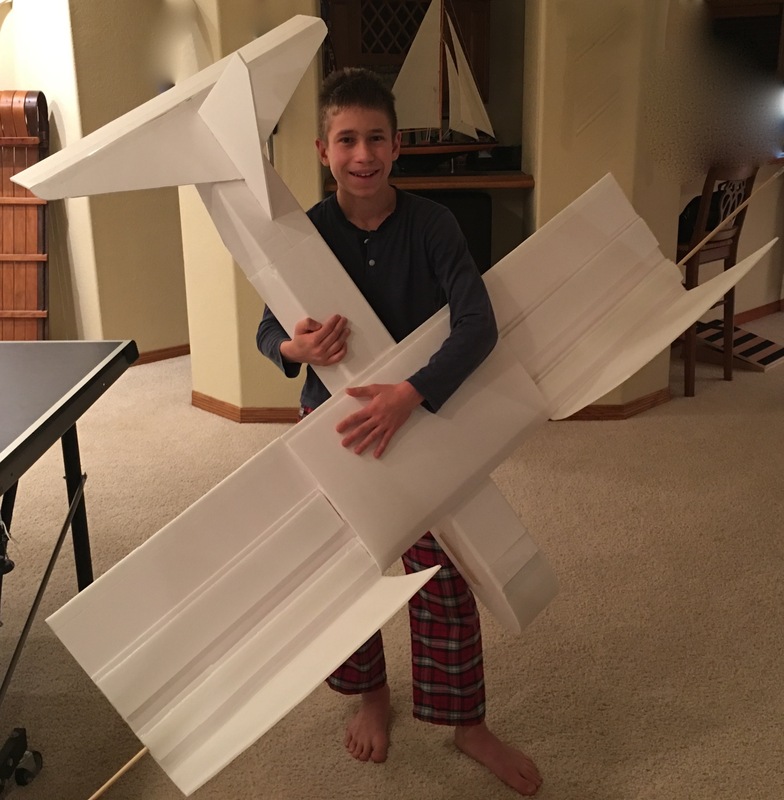 I did finish building the 13" wing chord wings but didn't glue the top of the wing to the former just yet because i realized i will be running wires through the wing and that i should wait to glue it on. Hoping to be done by next saturday or sunday. I'm still waiting on my power packs to ship. @b-29er I have a question for you and maybe others can weigh in, but is it possible/advisable to use ailerons as flaps for increased lift on takeoff with these large, slow bomber type planes? I am just thinking takeoff for these planes with a substantial load would require a ton of runway space to gain enough airspeed. If so, is it something easily configured in a Tx? I don't have a fancy Tx yet with programming capabilities yet, mine is an antique 4 channel AM Futaba. So yes, you can use your ailerons as flaps, its typically called flaperons. The problem is you probably won't see much benefit from having flaps, but you're welcome to try. Unfortunately you will not be able to do this simply because your TX does not have enough channels. You would want 5 or better channels, because that would at least include a 2-position switch. I would look at switching over to something cheap like a Turnigy 9x and an FrSky radio module, since that would be very reliable and give you as much mixing potential in transmitter as you can handle, including dual rates, expo, mixing on switches, constant mixing, etc. I am using a three quarter inch thick wood spar from home depot. Thats gonna be beefy but will work quite well for you. 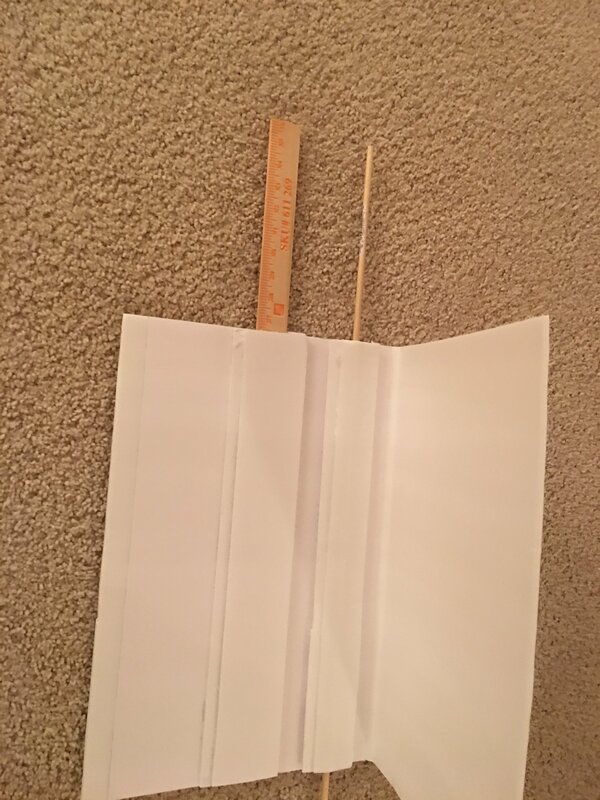 I usually suggest the home depot ruler because it keeps weight down, and you can keep the strength going in the important direction, vertically, but if you're doing the armin wing, you're going to wind up with a wing with a 1.25/14 aspect ratio or about 9% which is pretty good. Glad to see the power system put to good use! A few things from looking at the thread so far.. Lots of great advice out there! For the overall design, I'd take a look at something like the Martin Mars. Big, thick wings and large tail surfaces. I also noticed that all of your drawn tail surfaces are triangular. If you aren't set on that look, I'd consider leaving some more chord at the tip. It gives the added benefit of a lot more surface area for hardly any extra weight, and getting rid of those thin points will also help on durability, less small points to break off . I'm still waiting for my power packs to ship, but I did some calcs for the weight of my plane. It looks like my plane will end up being almost 270W/lb. the entire plane should be around 1100g when done with two batteries, it looks like the C-packs have about 1200g of thrust each. I think this thing is going to be a handful and probably out of my current skill range. Oh well, it's going to be fun and if/when I crash it, I have a lot of things I want to change/redesign on the next go round. This dude knows what hes talking about. Martin Mars is a great example of a plane good for heavy lift. Lots of wing area, massive semisymmetrical airfoil (20% thickness at the root! Lots of area to use cheap materials to create a very strong spar), lots of elevator area for low speed regimes. And the airfoil in this case was symmetric so inverted flight isnt out of the question. The symmetrical airfoil is another good point, now I have another item to add to the list of changes I want to make to my design. The Mars did use a symmetrical airfoil, but it also had 5.5 degrees of incidence. A heavy lift model will either need some incidence if using a symmetric airfoil, or need a thick asymmetric airfoil (USA 35A, USA 35B, Clark Y). The USA 35B and Clark Y are both excellent airfoils with gentle tendencies. You might consider adding split flaps for a heavy takeoff for the 35B or Clark Y though. It will give you the increased lift for takeoff, but you can retract them in flight and reduce cruise drag. That is a very good idea, here is a link to some fowler flaps that Andres designed for his P38 build. Fowler Flaps I will look at adding them between my nacelles and fuse. Yes he should! F106 Delta Dart gave me the ESC's and Motors along with about 20 props at flitefest Texas so without him none of this would have started! If you are using flaps simply to assist take off then you really don't need, or want, anything fancy. A simple hinged flap at 5 degrees will give you significantly more lift with little extra drag penalty. As F106DeltaDart points out a Fowler flap has a complex linkage and at at low flap angles has no real benefit over a plain flap. How much flap do airliners use on take off compared to landing? Split flaps are intended to create drag with only a modest lift increase to allow a steeper descent without unduly increasing the plane's speed. So i finished the wing mount. The first picture is of the wing unmounted with both spars in place (although the circular dowl is uncut). The second Picture is of the wing mounted fully attached to the fuselage. The third picture is how i did the wing mount. I have two pieces of wood on top of the wing. These are bolted through two layers of foam and one layer of wood to the inside of the fuselage. The last picture is of me with the plane. Airfoil isn't glued yet. The exterior wing pieces also need to be screwed in. Then just need to add electronics and i will be done. Sorry about the goofy smile. Finished it at about 11 so was very tired. That is a serious bit of foam board building. It looks about the right proportions. Maybe the fixed tail plane and fin could be a bit bigger although I do worry about the size, or rather the depth, of the wing spars for load carrying. 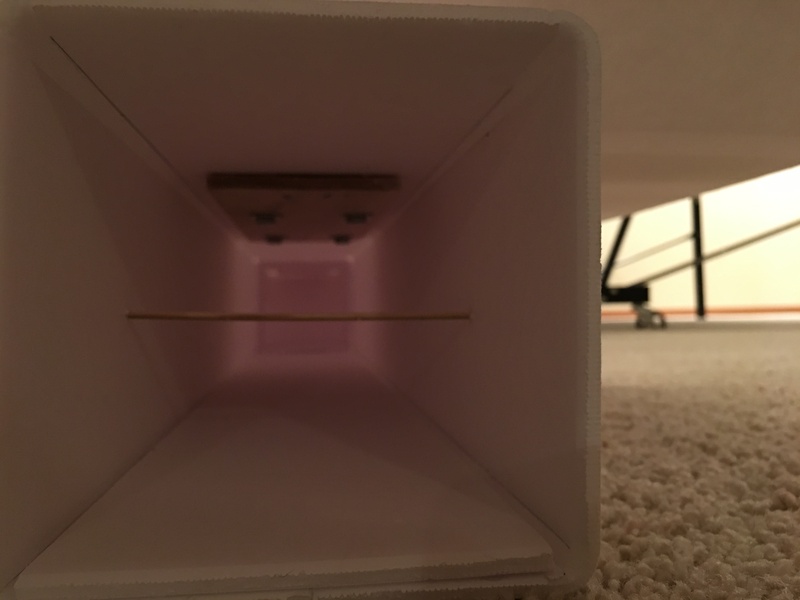 The stiffness of a beam is proportional to the cube of its depth so twice as deep = 8 times as stiff! 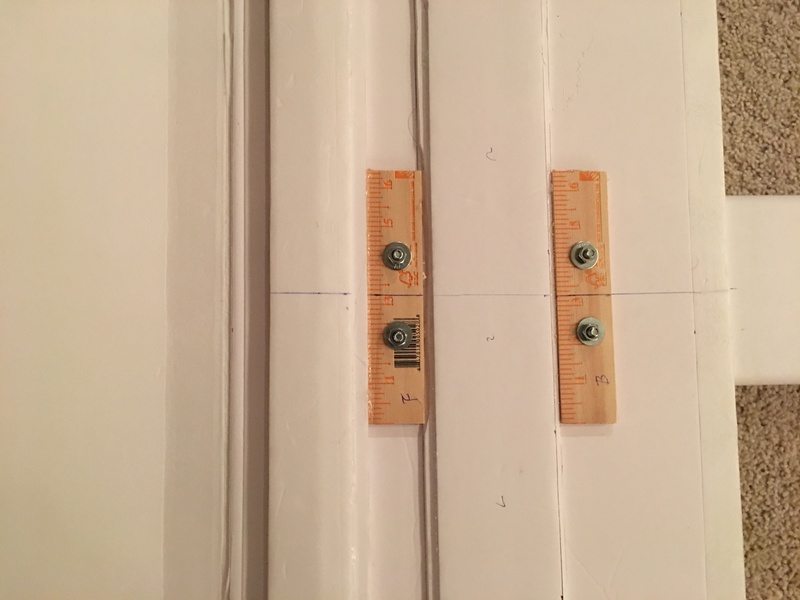 Or put another way just how much stiffer is a ruler on 'edge' when compared to being flat?